Miller Motorsports Park is a state-of-the-art road racing facility for automobiles, motorcycles and go-karts located just 35 minutes from downtown Salt Lake City in Tooele, Utah. It is considered the finest facility of its type in North America. Opened in 2006, Miller Motorsports Park hosts many of the world’s most significant racing series, including the American Le Mans Series, Grand-Am Rolex Sports Car Series, NASCAR Grand National West Series, AMA Superbike Championship and, new for 2008, the FIM SUPERBIKE WORLD CHAMPIONSHIP, one of the top three racing series in the world. In addition to the professional racing series that visit Miller Motorsports Park, the track also has its own locally-based racing series for road racing cars and motorcycles, Supermoto motorcycles and karts (with competitor’s ages ranging from five to 65 years old). There is racing taking place almost every weekend between April and October. 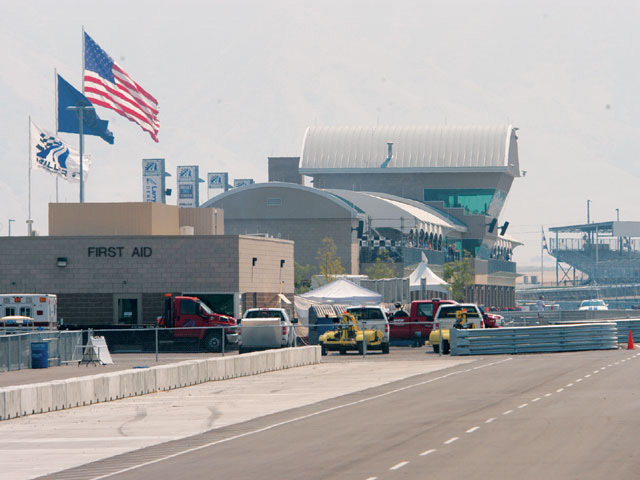 The track at Miller Motorsports Park is a 4.5-mile, 40-50 foot wide, 24-turn circuit, the longest in North America. It has four different configurations, ranging from two different 2.2-mile circuits (East and West Courses) to the 3.08-mile Perimeter Course and the 4.5-mile Full Course. The 3500-foot main straightaway allows the fastest cars and motorcycles to approach 200 mph before braking for Turn 1. The 511-acre facility also boasts a 0.9-mile paved karting circuit, one of the finest in the country, with 20 different configurations available. Miller Motorsports Park offers something for almost every motorsports enthusiast. There are rental karts available for young and old. The Performance Training Center offers classes in auto racing, high-performance driving, karting and Supermoto, plus a Teen Driving Academy, Highway Survival School and Winter Driving Academy. The Larry H. Miller Museum is home to some of the world’s most significant racing cars, specializing in cars associated with the legendary Carroll Shelby. The Race Fanzz retail store offers clothing, souvenirs, collectibles and gift certificates. The track also holds open track days during which individuals can drive their car on the track after a brief orientation course, and has a multi-level Club Membership Program that offers exclusive access and amenities. Corporate Activities are very popular at Miller Motorsports Park, with full banquet, conference and classroom facilities available plus a variety of entertainment and team-building options utilizing the racetrack, school and karting facility. Miller Motorsports Park is unique in that it offers spectators almost 100% sightlines of the entire track from any viewing location, while providing up-close viewing of prime race-action zones. This is possible because of the inherently level nature of the property, which allows spectators to be located around the perimeter of the course while ensuring that the track layout brings major overtaking and action zones close to spectator areas. Six different spectator areas, known as Oases, are prime viewing areas featuring raised spectator banks, grandstands, restrooms, concessions, catering, nearby parking and other amenities. These Oases are linked by roadways that provide access to each other and to the Paddock and Expo area, and are also connected by pathways that follow the track’s perimeter. Miller Motorsports Park is situated in Tooele County, just 25 minutes from Salt Lake City International Airport, 35 minutes of downtown Salt Lake and about 10 minutes from Tooele or Grantsville. It is directly adjacent to Tooele County’s Deseret Peak Recreation Complex. Miller Motorsports Park is easily accessed by major highways (I-80) and surrounding county roads. Miller Motorsports Park is the most advanced, safest and best-equipped road racing facility in North America. So outstanding was its design and execution that it was named “Motorsports Facility of the Year” by the Professional Motorsport World Expo in Cologne, Germany, on November 8, 2006. The facility offers something for everyone, with outstanding fan amenities, unmatched corporate meeting and entertainment options and the finest paddock and garages available for teams. Miller Motorsports Park is a significant addition to the national road racing industry, and a major component of the ever-growing Salt Lake City sporting market.